Also 3 pre-season games on Comcast. Will the games broadcast on WGN be broadcast nationwide or only in Chicago??? I hope the guys with the brains know what they are doing. Outdoor game March 1 !!!! In 2012 it was 65 degrees and in the 80s by the 10th. Maybe they gonna play roller hockey. Does anyone miss Gary Thorne on National Broadcasts? I don’t mind Doc or Dave Strader for that matter, but thought Thorne did a good job. I am surprised no one gets him after the Orioles season is over, but it is probably hard because baseball starts so early in the spring. I also think Eddie O’s analysis is really good and I like how he uses the telestrator to explain things to those who don’t know “strategic” hockey (me). Pierre McGuire and Mike Milbury should never be involved with any hockey telecasts…ever. As you can probably tell, I don’t live in Chicago anymore and really miss Pat Foley. All I get is NBCSN or Blues’ telecasts (eeeek). I didn’t take a close look at the schedule until now – if I added correctly the Hawks have 17 back-to-back games. That has to be in the top 5 or 6 teams in the league for most back-to-backs. 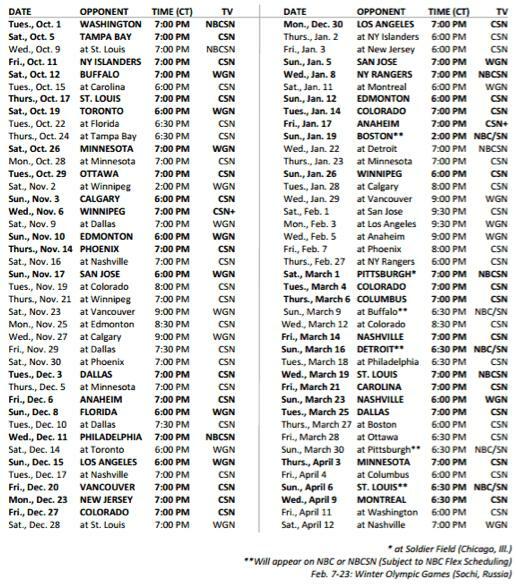 I know the UC has to accomodate the circus and Ice Capades so every year the Hawks have those two long road trips – and supposedly that’s the reason why the Hawks have so many back-to-backs … but I don’t buy it. Look at the first 3 games of the season – October 1st, 5th, and 9th – that’s 3 games in 9 days. The schedule makers could have slid in a 4th game in those 9 days and eliminated one of the back-to-backs. 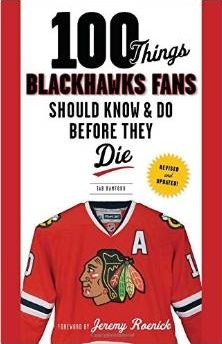 OK, I’ll get off my soapbox, but it irks me the Hawks get hosed every year by the schedule makers. Football is back and Hockey is on the way best time of the year hands down!! !